I'm pretty sure I saw Under the Sign CD in a record store in 1990. So, it must've been Under One Flag pressing, the only explanation - seems nobody is aware of this pressing, judging from here. This version was likely pressed in 1994-95. As it doesn't have Mastering SID Code, which is in line with Black Mark Releases pressed at the same plant at this period. Looking for copy in shrink w/ sticker. Feel free to message me for sale or trade. So glad to have this original pressing. Sounds so much better than any of the reissues that followed it. Man they really messed up the sound of this album when they reissued it, same for the first album and The Return. This was before they jacked up the sound when it came out on CD. Legitimately sounds completely different production-wise. As eloquently stated previously this is unquestionably the greatest Black Metal album ever. Nothing really comes close. Equimanthorn alone is worth the price of purchase. Quorthorn was blazing a trail, in a league of his own in the 80's (including 'The Return' that he admitted he barely remembers making, he was so drunk) that many aspire to but likely none will ever match. In 1987 it was too early for anything to be as remotely as powerful as this, anything as remotely as macabre. This album was extreme by all means by the time, both musically and in the resources employed. Neither Slayer,Venom, Possessed, nor Death, even touching similar grounds were as close to reach the "perfection" of a music so abrassive and yet so powerfully atmospheric. While previous albums were rutheless and defined what will be the blast beat for the upcoming black metal generation, this particular one paved the way for dark ambient as well, take notice of the subtle interludes in the opening track "Nocternal Obeissance", depicting a scene of atmospheric ritualism that could be well the initiation for what will later be a band like Aghast on the Cold Meat Industry. Or how the organ notes and the damned voice from beyond the grave could pretty well revive images from the morbid tales of Allan Poe so effectively. Or the doomed ambience and pace of "Eternal fire" with the -for the time" extremely powerful mix of synths and guitar arrangements in a very precise form can also bring the scenes of a hellish abyss. It is in the concatenation of the lyrical elements, such as the extremely powerful and enticing rhythms from the guitar and the tribal like beat of the drums where the heart of the effect reside, adding the often abrasive yet utterly dramatic guitar interludes in between the rythmical section, aided by the pervading synth lines or premade effects, creating this solicit aura of darkness and malevolence. 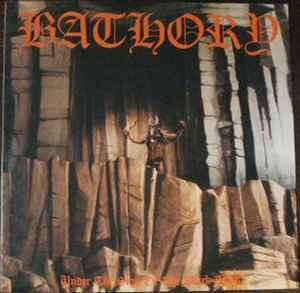 Everything is granted by the genious of Quorthon that conformed an album with a strong sense of atmospherics concocted in the oven of analog synth, basic guitar drone and drums (epic for the time!) , equal dose of doomed guitar arrangements and interludes, rhythmic changes and an energetic proportion of merciless blast beat to balance the album in the proper ammount. Another thing to notice is the lyrics implied in this album, they are so damn rich in images and descriptions. "Woman of dark desires" for example is a perfect tale of gothic horror along with "Call from the grave", so plenty of description and detail of sensation and sentiment. The best tracks in my opinion are nevertheless the mid paced ones, "Woman of dark desires", "Call from the grave", "Into the eternal fire" and "13 candles" for all the powerful magnetism and aural charge they grant, while the rest remain as examples of the uncompromised brutality of the blast beat and stormy rhythm so characteristic in the debut and in "The return". Equally "Equimanthorn" is somewhere in between the region of virulent rhythm, mid paced rhythmic changes and atmospherics making it a pivotal centre, so well placed at the middle of the album. This is the godfather of black metal by all means, still today it sounds so ominously obscure. My copy has one label wrong: it says ROUGE MALE - Animal Man (on Music For Nations). The music is correct though. Possible year of release: I bought this in the spring of 1998.